No, this is not an April fool. 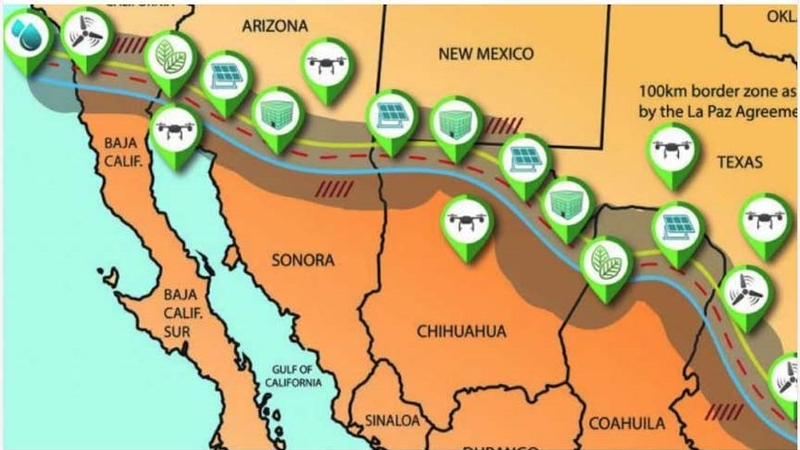 A group of 28 Engineers and Scientists have proposed we build a different kind of wall along the Mexican border. 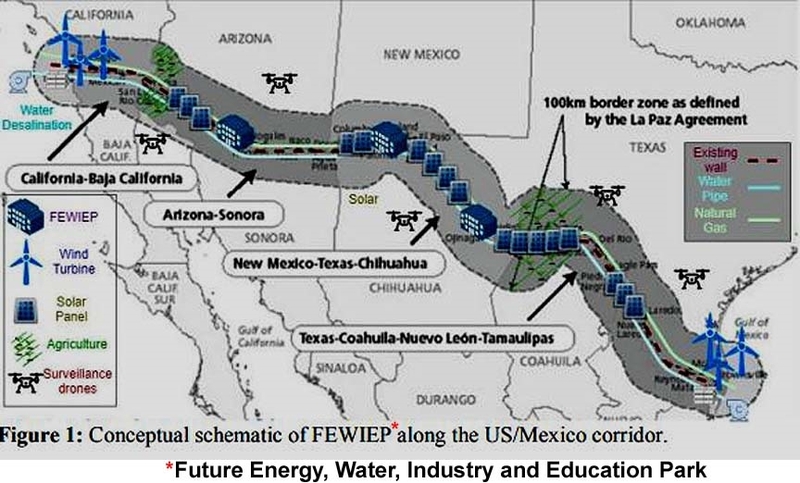 A wall of guarded solar, wind, natural gas, and desalination facilities where there isn’t a physical barrier yet. On August 14, 1983, the United States and Mexico entered into the United States–Mexico Agreement on Cooperation for the Protection and Improvement of the Environment in the Border Area, known as the La Paz Agreement. The agreement aims to protect and conserve the environment along the border. The agreement sets forth the responsibilities of both parties to prevent and control air, water, and land pollution in the border area. This agreement is made in accordance to each country's laws. The agreement entails that both parties must take responsibility for their border area and have the right to raise concerns if one state's environmental hazards linger into the other. ~snip~ Thirty years after it was signed, the La Paz Agreement remains the keystone agreement for bilateral cooperation on environmental protection in the border zone. In a white paper, the team called it a "future energy, water, industry and education park" that "will create massive opportunities for employment and prosperity." "Just like the transcontinental railroad transformed the United States in the 19th century, or the Interstate system transformed the 20th century, this would be a national infrastructure project for the 21st century," Luciano Castillo, Purdue University's Kenninger Professor of Renewable Energy and Power Systems and lead of the consortium, told Phys.org. "It would do for the Southwest what the Tennessee Valley Authority has done for the Southeast over the last several decades." Building such a park would undoubtedly be a complicated, expensive undertaking. The team estimates the solar energy arm of the project alone would require 8 million solar panels and cost $4.5 billion. "At first blush the idea seems too big, too aggressive, but consider the Roman aqueducts or the transcontinental railroads—enormous undertakings that gave enormous benefits. The cost of providing basic, essential infrastructure to the border lands is tiny compared to the opportunities it creates," Ronald Adrian, Regent's Professor at Arizona State University, told Phys.org. "I view this project as a means of creating wealth by turning unused land of little value along the border into valuable land that has power, water access and ultimately agriculture, industry, jobs, workers and communities. With only a wall, you still have unused land of little value." This may come to fruition because the owners of those congress critters could make a fortune on this project. I'm sure they could siphon a few Billion off the programs helping poor people. Heh, what are they gonna do about it, vote? We have ways of preventing that too.